All new designs for 2019! Our next Holiday Box is here! This box is different than and separate from our monthly subscription boxes. It doesn't require a subscription and is sold separately from our normal monthly boxes! These are BRAND NEW DESIGNS. They are not the same dies as last year’s holiday box. All new designs for 2019! The box cannot be shipped with other items. If you purchase this box with other items, you will receive a separate invoice for shipping of the box. The box include 3-5 exclusive items such as pancake dies, impression dies, shot plates, stampings, etc. These items are exclusive to the box and will not be sold individually on our site to the general public. The pancake dies will be brand new, never before sold by Potter USA !! Hurry and grab this Valentine’s Day box - once they are gone, they are gone! **THIS BOX IS NOT A PART OF THE MONTHLY SUBSCRIPTION! THE VALENTINE’S DAY BOX IS A SEPARATE BOX AND ORDER, AND MUST BE ORDERED SEPARATELY. 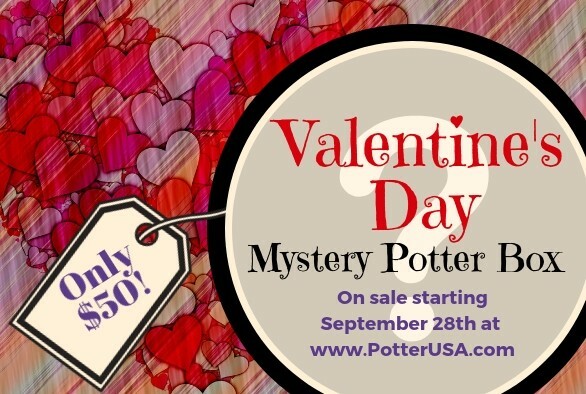 THE FEBRUARY POTTER BOX WILL NOT BE HOLIDAY THEMED.